The American Association for the Advancement of Science (AAAS) has a short profile of Dr. Jeff Meldrum. 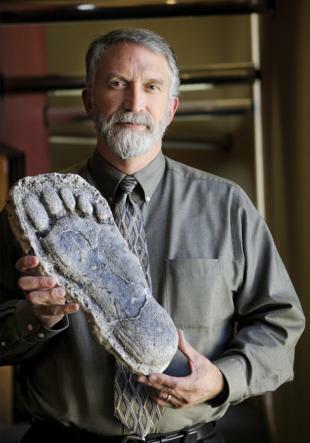 AAAS Member Jeff Meldrum has been facinated by the possible existance of Sasquatch since he was a child. Background: As a professor of anatomy and anthropology at Idaho State University at Pocatello, I teach human anatomy in the health professions programs, as well as biological evolution and primate studies. As a researcher my interests encompass a number of topics ranging from science and religion, New World paleoprimatology, vertebrate evolutionary morphology generally, bipedalism and the emergence of modern human walking and running more specifically. Question 1. Why did you become a researcher/engineer/scientist? Answer: I have always been fascinated by life on planet Earth -- from my first insect collection, to the recovery and naming of extinct primate species from fossil remains. The lure of exploring new frontiers, uncovering novelties -- past and present -- drew me to the sciences. Question 2. Share a story from your past that led to your choosing your field of work? Answer: As a youngster, I attended a showing in the Spokane Coliseum of a documentary showcasing the Patterson-Gimlin film, which depicts a Bigfoot (or Sasquatch) filmed in northern California. My fascination with primates and early humans, and with all mysteries on the fringe of acknowledgement, seemed to converge in that film clip. The prospects of a living primate species more closely related to humanity than any other, sharing our adaptation for walking upright, spurred me on to further exploration. Question 3. What are you most proud of in your work? Answer: I have a sense of accomplishment that my attention to the evidence for the existence of Sasquatch has kept this matter before the gaze of the scientific community and engendered meaningful dialogue about it. To have these efforts recognized and encouraged by the likes of George Schaller, Jane Goodall, and Russell Mittermeier has been very gratifying. Question 4. Share a comment or opinion you have on a topical science-related issue? Answer: There is a growing awareness of the bushiness of the hominid family tree, as well as increasing indications of the very recent persistence of a number of the branches on that tree. This raises the possibility that some of these species may in fact persist as relict populations in various corners of or globe. Mounting evidence is being seriously considered by more and more scientists. Question 5. Share a Web link/video/blog etc. that you found that really excites you and tell us why. Answer: In order to provide an objective venue for the publication of scholarly papers addressing the question of unrecognized species of apes and prehumans persisting into the present, and to encourage discussion among the broader scientific community, I am editing a refereed online journal, The Relict Hominoid Inquiry. The first of what I expect will be a sustained series of stimulating and illuminating research papers, essays, and reviews are soon to be posted. The site is under construction: http://www.isu.edu/rhi. 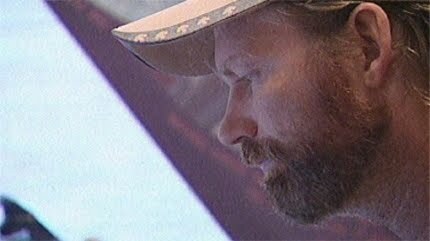 US News World and Report, a very reputable publications, has a document from the national archives supporting that the US Government did, in fact, believe in the Yeti. Click the image below to see larger version. Newly unearthed State Department documents confirm for the first time Uncle Sam's belief that the Abominable Snowman roamed the mountains of Nepal in the 1950s, a finding that has shocked federal officials including the archivist who discovered the papers. 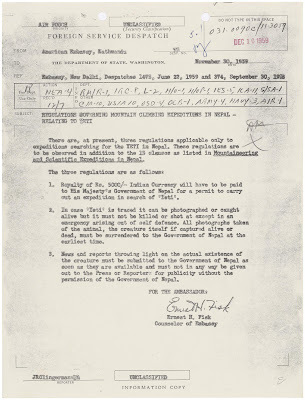 Long written off as a myth—it was never caught or photographed—the documents provided by the National Archives show that officials in the State Department, Foreign Service, and U.S. Embassy in Kathmandu, Nepal, not only believed in "Yeti," but endorsed rules for American expeditions to follow when hunting the toothy monster down. The first rule required that expeditions buy a permit. The second demanded that the beast be photographed or taken alive. "It must not be killed or shot at except in an emergency arising out of self defense," wrote Embassy Counselor Ernest Fisk on November 30, 1959. And third, any news proving the existence of the Abominable Snowman must be cleared through the Nepalese government which probably wanted to take credit for the discovery. Archivist Mark Murphy said he couldn't believe his eyes when he discovered the long-ignored papers written at the end of the Eisenhower administration. "I thought I was seeing things," he said. 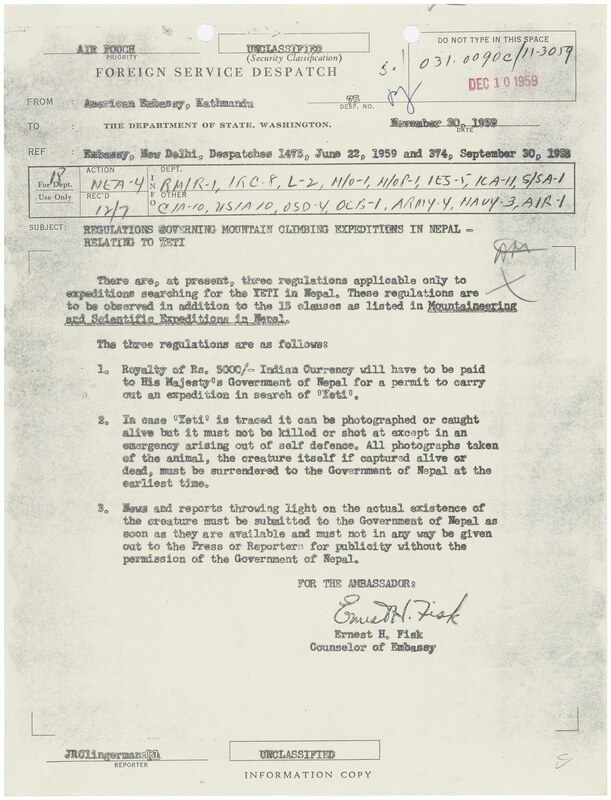 "These documents show that finding the Yeti was a big deal in the 1950s. It goes to show the government was taking this seriously." "American resources in the last two years have been concentrated on efforts to capture the abominable snowman," the record reads.